Arvin, a small city of 19,304 located in Kern County 15 miles southeast of Bakersfield in the far southern end of the San Joaquin Valley, is a center of growing resistance to the powerful oil industry’s air and water pollution. On October 1, the Center on Race, Poverty & the Environment (CRPE) joined the law firm of Shute, Mihaly & Weinberger, LLP in filing a lawsuit on behalf of the Committee for a Better Arvin (CBA) to stop Petro-Lud, Inc. from constructing and drilling four new oil wells adjacent to homes within Arvin city limits. Petro-Lud is a full-service drilling and service company operating primarily in California’s San Joaquin Valley. The city, with a 2010 Latino population of 92.7% including many farmworkers, approved the project without conducting the environmental review required by the California Environmental Quality Act (CEQA), according to the groups. Kern County features the heaviest concentration of oil drilling operations in California, as well as some of the largest corporate agribusiness corporations in the world, including Stewart and Lynda Resnick’s The Wonderful Company. In 2007, the United States Environmental Protection Agency(EPA) listed Arvin as having the highest levels of smog of any community in the U.S., in spite of California’s facade as the nation’s “green leader.” The city's level of ozone, smog's primary component, exceeded the EPA's acceptable limits an average of 73 days per year between 2004 and 2006 alone. Tu said oil and gas drilling and transportation results in air and water contamination, noise, traffic, and other negative environmental impacts. She said these activities can also produce both short and long-term health impacts and diminish the quality of life for nearby residents. As a result of this legal action, CRPE and CBA said they hope that a full environmental impact report can be completed in order to “make sure the health and safety of the residents of Arvin is prioritized by all, especially those who stand to profit." Shannon Chaffin, Arvin City Attorney, said he hasn't seen the lawsuit yet, so he couldn’t comment on it. 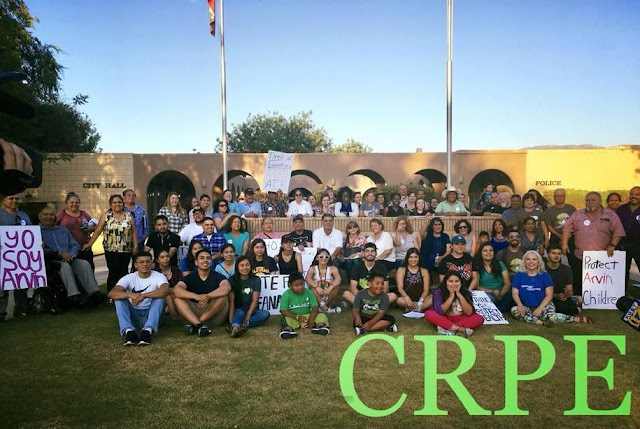 In July, CRPE and CBA successfully pressured the Arvin City Council to pass an updated oil and gas ordinance that imposed more restrictions on new oil and gas operations in the city of Arvin. The four new wells are planned at a time when Governor Jerry Brown’s oil and gas regulators have overseen a big expansion of oil wells in California. Over the past seven years, the Brown administration has approved 21,000 new oil and gas drilling permits in California, including 238 offshore wells in state waters under existing leases in Los Angeles County and Ventura County between 2012 and 2016. “The analysis found that 77 percent of the permits for new oil and gas wells issued since Brown took office in 2011 are in communities with a higher-than-average percentage of residents living below twice the poverty line and/or communities with a majority nonwhite population,” the Center said. California’s Division of Oil, Gas and Geothermal Resources (DOGGR) approved 21,397 new wells between Jan. 1, 2011 and April 14, 2018, according to the Center. Of the 16,554 of those wells with available geographic information, 76 percent are located in communities with above-average poverty rates for California, while 67 percent are located in communities of color. Despite the state’s “green” image, the oil industry is the largest corporate lobby in the state and the Western States Petroleum Association (WSPA), the trade association for the oil industry, is the largest and most powerful corporate lobbying organization. If you want to know the industries, organizations and people that control California, WSPA and Big Oil are right at the top of the list. WSPA represents a who’s who of oil companies including oil giants Chevron, Exxon, Occidental Petroleum and many others. The companies that WSPA represents account for the bulk of petroleum exploration, production, refining, transportation and marketing in Arizona, California, Nevada, Oregon, and Washington, according to the WSPA website, www.wspa.org.